Traveling with pets can be like traveling with kids, impossible! Of course you love your dogs and you want them to have adventure and not just be locked up in your backyard all the time but sometimes they can be a handful. You already know that pets are a big responsibility, so instead of begging your friend to dog-sit while you go away here are some tips to make traveling with pets a little easier. Just like kids, your dogs need to eat. Hopefully you feed your kids more often and more nutritious food but you need to make sure your dog gets fed. Forgetting their dog food and giving them your food is bad news. Your dog will not be used it and neither will their digestive system and that could get messy if you know what I mean. Make sure you pack your dog’s food first. Before you leave divide each day’s food into a little baggy so each day you can just empty their food into their doggy bowl without bringing their huge bag of food and serving cup. It will be easy and anyone can help you feed them without asking, “how much food do they eat” because its pre-measured. Now you don’t exactly want to travel with gallons of water so just make sure you know where you will be getting your water. If you are camping you may want to call ahead or maybe traveling with gallons of water is your only choice. 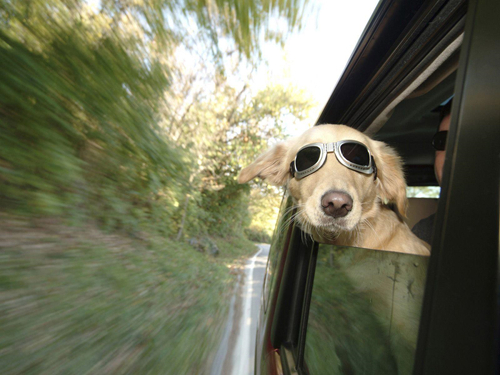 Make sure you keep a few bottles of water for the car ride if you are taking your dog along on a road trip. Make sure you bring plastic bags because your dog will be going to the bathroom in new places and could be marking their territory anywhere and everywhere they choose. Cleaning up after your pet is always important. Having a carrier, at least for smaller dogs is ideal when you are traveling unless you are okay with your dog riding shotgun. Pet comfort is important and if you are planning on going to the beach or the desert or anywhere with a lot of sun you may want to consider bringing along a dog canopy. Dog canopies will protect your dog from long hours in the sun and give them a place to sleep that’s comfortable so they will not have ants, bugs or anything else creepy crawly get on them or under them. Don’t forget their chew toy! Kelly Swaim is marketing associate for Bravo Sports makers of pet shade products for their Quik Shade Pets brand.